We don't have any trips to Armenia at the moment . Located in the Caucasus region, straddling both Asia and Europe, Armenia is the perfect destination in which to journey through history, culture, and religion as it has one of the richest and longest histories of all countries in the region. Bordered by Turkey, Iran, Georgia and Azerbaijan, Armenia is a mountainous country and much of it sits at altitudes of around 1800 meters above sea level. 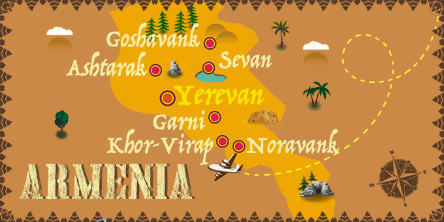 A tour of Armenia is the perfect way to realize the fascinating, complex and significant history of the country. Not only was it the first country in the world to adopt Christianity as the state religion, shortly following Jesus’ death, it is also a former Soviet state, with many attractions and sights to spark the curiosity of all who visit it. Ancient religious sites such as monasteries, churches and even a Greco-Roman temple help to encourage tourism to the country, many of which are located in spectacular natural scenery.